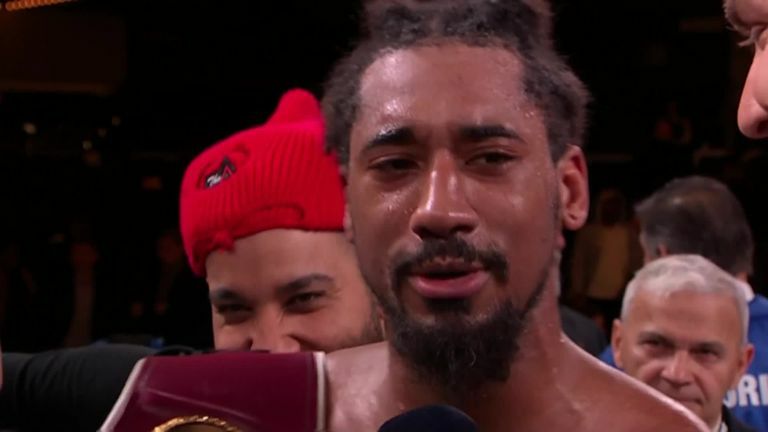 Demetrius Andrade won with a 12th round knockout over Artur Akavov to keep hold of his WBO world title. Demetrius Andrade successfully defended his world middleweight title against Artur Akavov and immediately called out Gennady Golovkin. 'Boo Boo' showed his technical brilliance in a one-sided show but failed to send a statement out to the rest of the division before it was bizarrely stopped in the final round. Andrade had landed three good rights but when referee Arthur Mercante Jr stepped in, the Russian and his team, as well as the Madison Square Garden crowd, were left bemused by the decision. It added another stoppage win to Andrade's unbeaten record but with Saul 'Canelo' Alvarez and Daniel Jacobs announcing a unification clash 24 hours earlier, it was the perfect platform to prove he is also one of the 160lbs stars. Will Gennady Golovkin take the challenge? The WBO champion at least eased through his first defence and after ruling out the former holder, Billy Joe Saunders, 'Boo Boo's talking made a bigger impact, as he went straight for former 160lbs supremo, Golovkin. "I wasn't going to try and force anything. The jab was working beautifully all night and at the end of the day, put Triple G in front of me, that will be shorter," he told DAZN. "If I just keep destroying them in the top 15, they'll have nobody else but to say Triple G, Canelo, Danny Jacobs, the great guys that's up there. "That's all we're looking to do is making great fighters baby. May the best man win." Andrade does have a belt to take to the table if he wants one of the big names next, but with challenger Akavov spending most of the fight on the back foot, the champion was unable to make the most of his MSG debut. 'Boo Boo's jab is one of the sharpest in the game and by doubling and even tripling it up, the Rhodes Island slickster took control from the opening bell. Demetrius Andrade wants to fight GGG next after successfully defending his middleweight world title. A big right in the second round suggested he could unlock the challenger's defence and with a sneaky left cross doing just that, the first half belonged to the talented American. On a night when Jorge Linares was beaten in the first round, maybe Andrade's cautious approach was understandable. He barely got hit himself and still rammed his jab through but it took until the ninth round for Akavov to cause him any sort of problem. The champion remained unruffled but with three rounds left and the points win a certainty, the New York crowd were expecting to see him step it up and close the show in style. In the 12th he landed three crisp right hooks, but even he didn't expect the referee to jump in and wave it off.